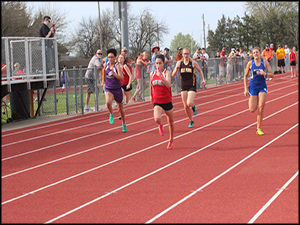 The girls and boys track team traveled to Belle Plaine to compete in their first varsity only meet. The Lady Rockets represented Rose Hill very well as they took 2nd overall. Leading the way for the team was sophomore Faith Exley. She placed 1st in the 200m dash and 2nd in the 100m dash. Senior April Carney also competed in those two events taking 5th in each. Freshman Jenna McCulloch ran in the 800m and took 3rd. Alexia Struble took on the 1 and 2-mile runs placing first in each. The 4x1 including Carney, Exley, Haley Thrush, and Aubrie Thomison took 2nd. The 4x4 took second with Thrush, McCulloch, Thomison, and Exley. Thrush also competed in the long jump and triple jump as she placed top 3 in both. Long story short, the Lady Rockets are performing very well with most of the varsity being very young. The boys also had a great competition as they placed 2nd overall. Sophomore Drew Leck ran in the 1-mile and placed 2nd with a time of 5:01.75. In the 110m hurdles, Lathe Cobb placed 2nd. In the long jump, Mason lane took 2nd with a distance of 19’ 1.5”. Colton McGrew brought home gold in the shot put. Their next competition will be on Thursday and Friday for pre-state. 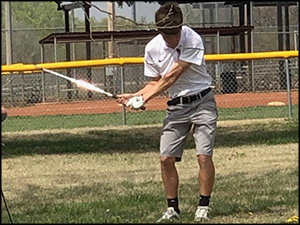 The Rocket golf team traveled to Augusta for the Augusta Invitational on Tuesday. The meet takes place at the Augusta Country club and is a 72-stroke par course over 6289 yards. In the team standings the Rockets placed fourth with a score of 402 finishing eleven strokes behind Circle. Coming in first with a score of 295 was Trinity. Noah Locke led the Rockets with a score of 86 on the day, 43 on the front nine and 43 on the back nine. He placed 8th followed by Brennan Evans in 17th overall. Shortly behind them were Zach Hoang, Justin Casey, and Lane Gardner in the 20th through 22nd spots. They will travel to Eureka on Wednesday for the Eureka Invitational. The Rocket Girls Swim team traveled to Newton for a very tough invitational that had several 5A and 6A teams. The team didn’t dominate the scoreboard but from talking with a few of the girls on the team they dominated the sportsmanship. 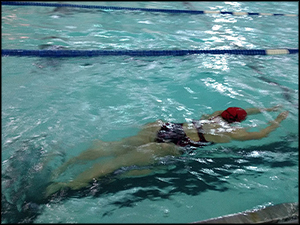 Tori Kaiser landed Rose Hill 7 points in the 100-yard butterfly. It was a great outing by her as she put together the only points for the team. Their next meet is Thursday April 18th at Hutchison.